I dont think anyone got on Davis for the ACT of firing Kiffen, it was the way he went about it. While still early since the story broke, I dont see the Yorks on national TV airing internal dirty laundry and slamming Nolan. I dont see them showing personal internal communications to the entire nation. If they do, I will slam them as well. bada wrote: I dont think anyone got on Davis for the ACT of firing Kiffen, it was the way he went about it. well thats true, however....when does anybody ever see the yorks? i didnt think kiffin should go...however i do like the no holding of punches by davis.....dude had something to say and said it no PC bullsh1t that is common throughout the nfl. you are totally right about that Joel. There is no doubt that Davis sells. I could not pick out the Yorks out of a lineup that consited of my wife, my mother, my grandparents, next door neighbor and them. Today, the MNF crew completely slammed the Niners front office. Chris Berman, TJ, Cris Carter, Keyshawn Johnson, and Mike Ditka were all saying smack about the front office of the Niners. Berman said he was "disgusted" with what transpired calling Nolan a "good coach in a bad situation," Keyshawn said Nolan doesn't deserve to be there if he's going to be treated like how he has been the past couple weeks and that the way the Niners treated Nolan with disrespect is something that he and "probably many others" would not want to be apart of. xbay wrote: Today, the MNF crew completely slammed the Niners front office. Chris Berman, TJ, Cris Carter, Keyshawn Johnson, and Mike Ditka were all saying smack about the front office of the Niners. That's what happens when the national media doesn't pay attention 99% of the time and then tries to weigh in on something like they're informed. Nolan was a good front office guy, but a horrible coach. He was so incompetent in game situations it was ridiculous. Some good points bought up in this thread. Captain Jack and Xbay yu touch on how the national media knows nothing about our situations and think they can roll with a story and be so called experts when they too busy covering the packers and the cowboys. bada and Joel... Al Davis reminds me of Aaron Spelling (creator of 90210 and Melrose Place) he's got more twists and kicks then a donkey on amphetamines. All i can say really to BADA is that i personally believe he jumped on the Al Davis hatewagon because of all the things he found out in the national media, i doubt he read any of the local rags and knows the real truth. But a real Al Davis Lover and a Real Al Davis hater will both agree that AL Fired Kiffin and basically wanted to get the last word. Bada what you must realize that after this all happened. Al was looking for a avenue to get rid of the kid without pay. Lane bitched about roster personnel, training camp competition but Al's final straw was the Lane not willing to accept responsibility for his defense in Week 1. Sorry all to hijack a Niners thread with Al Davis properganda but i had to let Bada know Why and how come. Because Al's mind is a tough one to figure out and it takes someone whom is insane to understand the evils going on with inside that brain. I think these guys are focusing too much on the person Mike Nolan and not the coach Mike Nolan. Last time i checked, u hired a coach for x's and o's and not coolness n likability. pawno, I will be the FIRST to admit that I hate Al Davis. Almost everything I say regarding the man has that agenda behind it so I am hardly impartial. But it is NOT based on media. My hatred of Al stems from a couple areas. One, it probably has some to do with being a lifetime seahawk fan so I have ZERO affection for any AFC West teams, but mostly it comes from the way he treats the fans of the team. 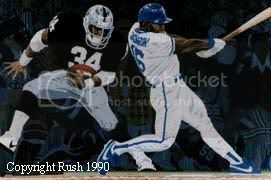 I moved from Seattle to the East Bay in 1984 so most of the friends I made here were Raider fans. I have just seen over the years how Al has treated these loyal fans. He really could care less about the fans. All his decisions and policies have been about maximizing income. Hell, he is a business owner and he has EVERY right to run his business the way he wants, but I dont have to respect the way he does it. He ripped the team away from the Oakland fans for a better deal in LA. He moved them back not because he wanted to reward the fans here but because he was guaranteed sellouts. When that did not happen, he has been trying to break the agreement so he can move again. He only cares that the team HAS fans so they can generate revenue, but it matters not what community they are in. He would move the team to bum **** egypt tomorrow if he had a sweet deal that generated more revenue than anyone else. What he forgets is that owning a team is an equity business. NFL teams have been skyrocketing in value year to year. The Raiders are probably worth at least 800million. He has probably made in value half a billion dollars over the past 10 years. As fans, we have an emotional attachment to this "product". I appreciate the owners that understand that. I will give him credit that he desperately cares about his players and about the team winning. I am not saying he ONLY wants to make a buck, it is just that his loyalty to his fan base is sorely lacking. bada wrote: pawno, I will be the FIRST to admit that I hate Al Davis. Almost everything I say regarding the man has that agenda behind it so I am hardly impartial. But it is NOT based on media. great points bada. Al Davis is no way perfect and no way loyal.is is obsess with his creation and the success it is, and does not move on. It is great to appreciate history but as everyone in business knows, u can never look to the past, u always have to look ahead, and somewhere in his lifetime, he stop putting that effort to continue to improve. As you mentioned the relocation fiasco, he also conned the city of Sacramento. when Davis was planning to move away from Oakland, he told the mayor and city council of Sacramento at the time that he would very likely move north there as long as the city covered all the stadium funds. The city wanted the team, so borrowed tons of variable rate interest bonds to show Davis how serious he was. He played the city for about a year, and ultimately chose LA of course, and the city got stuck with these costly bonds that grew so high. There was that gravel quarry deal where Al conned the locals. He pretended to be interested in building a stadium in the pit as it would save money and although there were no nearby cities, The Raidas would draw from many miles away, he said. All he needed was a non-refundable $10 million up front to show good faith. The locals raised that money, raised their local taxes and all that. Al put the check in the bank and when it cleared, he did too. The good folks of East Dead End, Home of the World's Biggest Gravel Quarry, got a good screwing and, like any STD, they are still paying for it today. Al is simply a crook, in my opinion. The Cosmic Forces evidently think the same way, as the Raider karma is very, very bad. ah yes, the city of Irwindale. I put some of the responsibility on the city to be stupid enough to give him $10 million without any conditions but the fact that Al pocketed that money we pretty despicable. The bottom line is he is just not a very good human being!